There are many ways in which games try to tell a story. 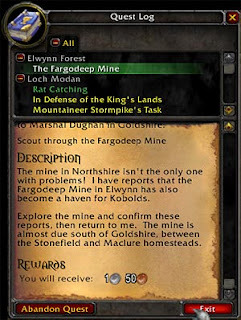 Most MMOs use text and quest logs to tell their story. I think this is a disservice to players. MMOs are almost all MMORPGs but many have had the RPG elements taken out. Without the concentration on storytelling there is simply the leveling game left over. Text is becoming antiquated in video games as the medium grows up. A step up from using text is the use of cutscenes. Older RPGs would use text for most of the story and then reward players with the occasional cutscene. Final Fantasy VII, VIII, and IX are all good examples of this trend. MMOs are finally adding cutscenes, but they aren't widely used. They usually show up at the very beginning to introduce the world and your character's place in it. With Wrath of the Lich King Blizzard also injected a cutscene half way through Northrend. Moving up to a higher level of storytelling leads to full voice work. This requires an immense amount of work that isn't needed when doing text only. Final Fantasy X was one of the first games to attempt this, although some text was still used. Mass Effect 2 is the quintessential modern day example of a great game using full voice work. Full voice work isn't the last increase in storytelling that can be done, it is simply where the industry is at the moment. Beyond this is actually getting a performance out of digital actors. Mass Effect 2 tries to do this sometimes, but more often than not the characters stand still while talking to one another. Compare that to a movie where each scene is blocked out so that the actors move around and interact with one another constantly. That is the next step in video game storytelling, giving animation to more than just a character's face and lips. We need full body movement and interaction. Keep your eyes on Heavy Rain and LA Noire to see how they attempt to incorporate it. Hopefully they push the medium forward.